September 29, 2015 • By request I added a window icon to the DateTimeBox.exe dialog window. It uses icon #167 from Windows' own Shell32.dll by default, but with the optional /I:number switch you can choose a different icon from Shell32.dll. • CameraModel.exe has been updated: it now supports (many) Samsung camera models too. September 24, 2015 • An annoyance in DateTimeBox.exe has been fixed: if the specified time format(s) would contain AM/PM on a system with 24 hour time format, the program used to return a generic "Invalid date/time format" error message; it will now inform you AM/PM is not a valid option on the current computer. Better still, two new optional command line switches allow you to almost seamlessly use AM/PM on 24-hour systems: /I24 will ignore AM/PM in the GUI input time format on 24-hour systems, and present a 24-hour time picker; and /O24 will ignore AM/PM in the requested output format on 24-hour systems, and then append AM/PM at the end of the output string. September 23, 2015 • An update to SiteMap.exe: 2 new optional command line switches, improved command line parsing, and improved help text. September 22, 2015 • Kang-Che Sung corrected an error in my explanation of code insertion and his solution to it. September 7, 2015 • As the list of excluded files became too much for SiteMap.bat to handle, I wrote SiteMap.exe (in C#) to generate the sitemaps for my website. September 2, 2015 • Kang-Che Sung provided an ingenious and remarkably simple solution to prevent code insertion with SET /P: use delayed variable expansion. It took me quite a while to figure out why this solution works. I'm impressed! August 25, 2015 • On my Add/remove leading zeroes page in the Batch File Scripting Techniques section, I mentioned FOR /F "tokens=* delims=0" %%A IN ("%Var%") DO SET Var=%%A as a fail-safe way to remove leading zeroes. However, as Mike Dallwitz pointed out, though it does remove all leading zeroes, that is usually not what we want — we want to keep a single zero. So I added a note in the Disadvantages column of the page. • There seems to be a problem with the new menu in some browsers (Chrome and Iron, maybe more): the menu always displays in full screen width and the "noscript" menu is not hidden. The problem is caused by cached CSS files. 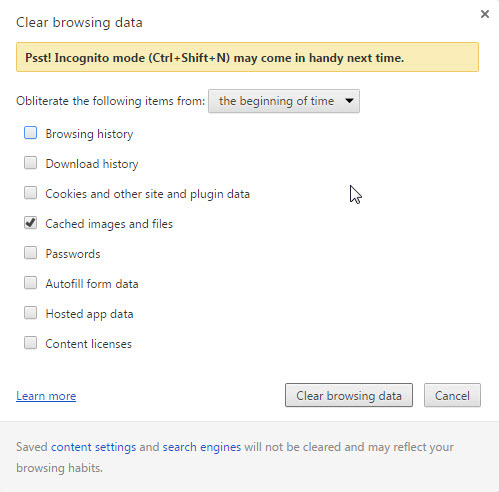 A quick workaround for you is clearing the cache — as shown for Chrome and Iron in the screenshot. The real solution for me is to rename the stylesheet files so the browser knows it has to fetch the new files instead of using the ones from the cache. On the test website, this problem never occurred, because there never was a file named "menu.css" before the current one on that website — but on the "production" site there was, the Tigra Menu also used a file named "menu.css"! August 24, 2015 • After 6 years of loyal service for this site, SoftComplex.com's Tigra Menu is replaced by a (customized) SlickNav Menu. The SlickNav Menu will adapt to small screens (the threshold is currently set to 800 pixels wide) by moving itself from the left to the top, and occupy the full screen width. Also on small screens, links will be padded with whitespace, to allow accurate touch navigation. This may make tables align a bit "jumpy". I'm still trying to find a solution. If you experience any "abnormal behaviour" of this site as a result of the change, please send a message to moc.eduowrednavbor@ofni . Replacing the menu is only the first step to make this site accessible on mobile phones, a lot more needs to be done. • As a result of the site "make-over", you may get some "false positives" from ChangeDetection. August 13, 2015 • Daniel Saul Dominguez suggested a way to trim the lines of PrintScreen.exe's text output. With some modifications, I implemented his suggestion: the new optional command line switch /C trims the output text before saving it (/C is ignored if in graphic screenshot mode). August 10, 2015 • To help me get "cleaner" screen captures of windows with transparent borders, I wrote WhiteBackground.hta. No big deal, just a full screen, blank, white window. To close it, press the Esc button, or right-click on its window to display instructions. July 28, 2015 • I updated the Cookies paragraph on my Site Policy page. July 24, 2015 • Ruud van Velsen released an update of KiXtart: version 4.66 fixes some issues and supports Windows 10! It can be downloaded from this site. July 9, 2015 • An error in DateTimeBox.exe has been fixed: the old version would fail on some AM/PM formats, the new version correctly handles the formats I tested with. July 4, 2015 • DateTimeBox.exe has been updated: a new optional command line switch /L allows Localized or customized captions for the "OK" and "Cancel" buttons. July 2, 2015 • ChkPath.vbs has been (partly) rewritten. The old version did not handle variable expansion correctly (e.g. %SystemRoot% would be expanded if the PATH was modified, and %SystemRoot%\system32 would not be considered a duplicate of C:\Windows\system32). and as an added bonus, has fewer lines of code. Note: Tested in Windows 7 only!